This two-volume series is a practical learning material for students working in a Chinese working environment. Each volume has ten chapters, with a workbook attached. Volume One aims to strengthen workplace communication with colleagues and bosses; Volume Two focuses on handling external affairs. Series consists of a wide range of topics including first day of work, company trip, marketing, customer complaint, layoff and merger and acquisition, etc. Each volume includes a textbook, a workbook and a teacher’s manual. Each chapter contains dialogue-based question, case study, culture appreciation unit and comprehensive exercise. 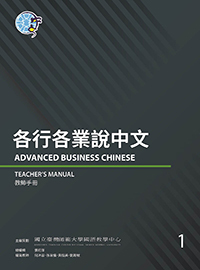 Advanced Business Chinese is suitable for learners who have complete A Course in Contemporary Chinese Volume 4 《當代中文課程 4》 or Far East Business Chinese Volume 3《遠東商務漢語 3》. This series covers levels B2 to C1 in the CEFR, or Advanced-high in ACTFL Guidelines. Including dialogue-based questions and case study for workplace problem solving. Including detailed explanations on useful expression. Including cultural appreciation unit based on Chinese workplace. Including a synopsis of learning and grammar focuses for each chapter.